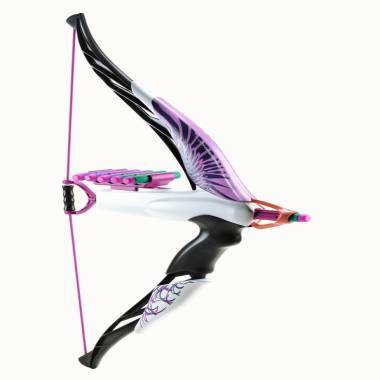 The Heartbreaker bow, part of the new Nerf Rebelle line, will hit store shelves this fall. Nerf has long been a favorite of little (and, let’s be honest, not so little) boys. But more girls may soon be getting in on the foam dart-shooting action as Hasbro prepares to launch the Nerf Rebelle, a new product line marketed for girls. First up will be the Heartbreaker bow, which will hit store shelves this fall. The line promises the same power as items in the Nerf Elite line, but with pretty girly colors and designs. Nerf, however, says the differences between the Rebelle and Elite lines go beyond pink. In an effort to connect with girls and how they play, the Heartbreaker will also come with collectible darts and the line will have an app, which encourages teamwork and strategy and lets girls capture photos and videos of all of the action. The bow is also sized and shaped differently, making it easier for young girls to handle. Frascotti also noted that in today’s age of childhood obesity, parents are concerned about the sedentary nature of traditional girls’ play. “We did a lot of research about girls and how they play and looked at what wasn’t in the toy aisle. We found a big white space opportunity for active play for girls. Other than sports, there aren’t a lot of active play opportunities for them,” he said. Given the popularity of "The Hunger Games" and "Brave," which both feature young heroines who are skilled archers, the Rebelle line may find an eager market. In the lead-up to last summer’s Olympics, many noted the rise in popularity that archery was enjoying, thanks to Katniss and her bow. Industry experts think Nerf might be onto something with the new line. “Girls love Nerf, but most Nerf is sold to boys. This says, ‘OK, you want to play Merida? You want to play 'Hunger Games'? Here’s something just for you’,” said Chris Byrne, toy expert and content director for Time to Play. The Nerf Rebelle line is the latest toy to get a makeover in order to appeal to a different gender. Recently, Hasbro announced that it would start selling Easy Bake Ovens in a more gender-neutral black-and-silver palette. That move was in response to an online petition started by a 13-year-old girl who wanted an oven that would appeal to her 4-year-old brother. The company was largely applauded for that change. LEGO has also made headlines in recent months for launching LEGO Friends, a new product line targeted toward girls. Although critics accused LEGO of promoting gender stereotypes with Friends, consumers have been scooping the toy up, helping to increase profits for the makers of the little bricks. And the gender crossover of toys seems to be a continuing trend. Dana Macario is a Seattle-area writer.